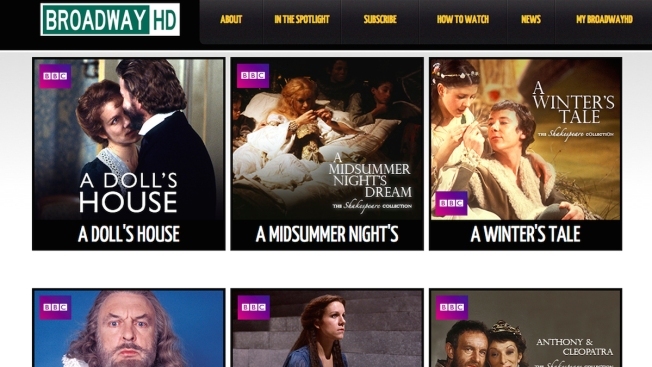 This screen image provided by BroadwayHD shows the home page for the new online streaming service offering high-definition broadcasts of top theatrical events to computers and phones. The service is scheduled to launch Monday, Oct. 26, 2015. A new online streaming service hopes to one day become the Netflix of Broadway, offering high-definition broadcasts of top theatrical events to computers and phones. It was founded by Broadway producers Stewart F. Lane and Bonnie Comley, a Tony Award-winning husband-and-wife producing team behind such shows as "On Your Feet!" ''A Gentleman's Guide to Love & Murder" and "Legally Blonde." "We're not going to replace the Broadway experience, but if you can't get to Broadway, get to BroadwayHD," said Lane. "Hopefully it will whet your appetite to go see it live." Users can buy a monthly subscription for $14.99 and or a yearly one for $169.99. There's also free content. The shows can be streamed to computers, mobile devices and TVs — both Apple TV or Google Chromecast. While the service currently leans heavily on the archives of the BBC, WNET-TV in New York and Broadway Worldwide, the creators hope they will be able to expand their titles with partnerships and their own captures. They've also added commentaries, introductions and documentaries. Offerings at launch include more than 120 productions, mostly classics from Shakespeare and Anton Chekov. "A lot of it is classic archival pieces, but then we start layering in the new things and go out and start shooting new shows," Comley said. "We're looking for this to be the landing place." The site comes at a time when so-called event cinema has exploded. When once there was just the Metropolitan Opera at the movie theater, now there's the Bolshoi Ballet, concerts from One Direction, circuses and a steady stream of English plays. "This is part of an evolution," he said. "We're never going to replace the communal experience of seeing actors live. I understand that. New York has an amazing caliber of talent — of writers, directors and performers — that we'd like to share with the world. If they can't get here in time, we can share that with the world in the best way we can." A sample of what you can now find on BroadwayHD includes Orlando Bloom in the 2013 Broadway revival of "Romeo and Juliet," a live "Jekyll & Hyde" with David Hasselhoff in 2001, Helen Mirren in "A Midsummer Night's Dream," Montego Glover and Chad Kimball in "Memphis," Daniel Craig and Stephen Rea in "Copenhagen" from a BBC TV movie in 2002, and Rufus Sewel in "Henry IV." Up next will be Audra McDonald as Billie Holiday in "Lady Day at Emerson's Bar and Grill" after it airs on HBO. "There's plenty of stuff out there but what we're trying to do is have anecdotal evidence for producers and all of the creatives to see where this goes," Comley said.